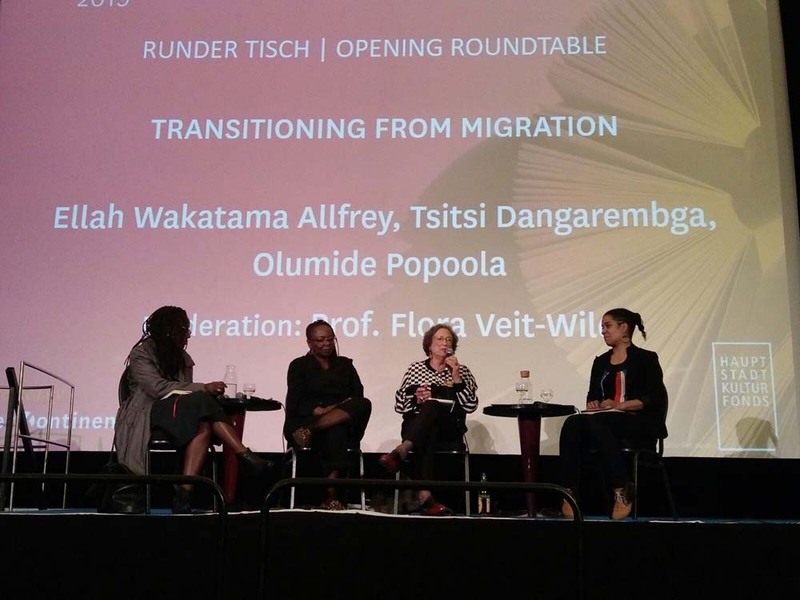 Tsitsi Dangarembga, Olumide Popoola, and Ellah Wakatama Allfrey were the first on stage at the African Book Festival 2019 in Berlin, Germany on April 4, 2019. The three were moderated by Prof Flora Veit-Wild. The opening roundtable of the African Book Festival at the Babylon Theatre in Berlin featured Olumide Popoola, Tsitsi Dangarembga, and Ellah Wakatama Allfrey. Popoola was the curator of the festival in 2018 while Dangarembga performed that role in 2019; Allfrey on her part would bring to the stage her considerable experience in the publishing of Africans and others for over two decades. The session was conducted by Flora Veit-Weld who was until recently a professor at the Department of African and Asian studies at the Humbolt University. In the one and half hour session entitled “Transitioning from migration,” the three would go through the festival theme and try and understand what is happening with migration. It was a bilingual session running in both English and German. Tsitsi was happy to note that it was good that the word in the theme was “migration” and not immigration as movement happens in all spheres. While Olumide opted to look at the bigger picture of migration and how it is affecting those who live in Europe who have to deal with the rising far right, Ellah was more philosophical looking at the inner migrant. What Tsitsi wanted to invoke in her writing as far as the festival theme was concerned, was that she wanted readers to involve themselves with the characters beyond just reading the book. Olumide spoke about her book When We Speak Of Nothing which would never have gotten a publisher twenty years ago with its subject matter that included a trans character. Ellah spoke about what the African literary scene would look like ten or twenty years hence and how we should try and influence that future now. She gave the example of Jennifer Nansubuga Makumbi’s Kintu which speaks about the Buganda Kingdom and then jumps forward to after the Idi Amin years. The book which opted to ignore the interjection of the British in the story of Uganda has inspired so much historical fiction in the recent past. It was an afternoon with panellists who were at the top of their game speaking to the theme which would be at the centre of discussions for the next few days. At the end of the moderator questions, audience members got to speak to the panellists and ask them questions about the theme and other related topics. You can watch the panel recorded here in full on my trusty phone below.